A SUITE in a hotel or other public accommodation denotes a class of luxury accommodations, the key feature of which is multiple rooms. Many properties have one or more honeymoon suites, and sometimes the best accommodation is called the presidential suite. Suites offer multiple rooms, with more space and furniture than a standard hotel room. In addition to one or more beds and bedroom fixtures, a suite includes a living room or sitting room, sometimes with a couch that converts into a bed. Dining, office and kitchen facilities are also added in many suites. Some properties offer only suites. In addition to the luxurious suites mentioned in the first paragraph, regular suites are particularly marketed to business travelers who appreciate additional space and may use it to host small meetings or entertain clients. 10 most expensive hotel suites in the world - TheRichest. 10 Stunning Hotel Penthouses - Departures. 101 best suites in the world - Elite Traveler. 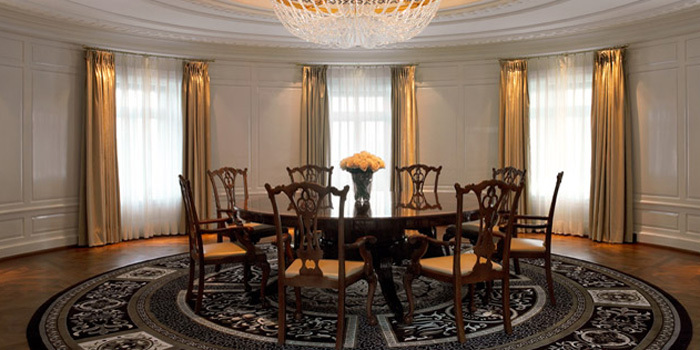 360-degree tour of the Lanesborough's £12,000-a-night Lanesborough Suite - The Telegraph. 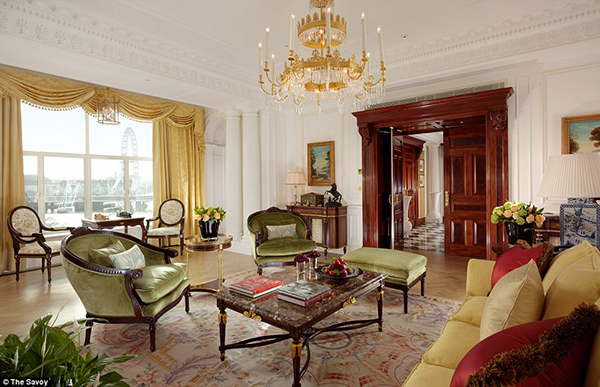 360-degree tour of The Ritz London's new Green Park Suite - The Telegraph. A Night of Luxury Can Be Yours for US$75,000 - The New York Times. Best Luxury Hotel Suites - JustLuxe. 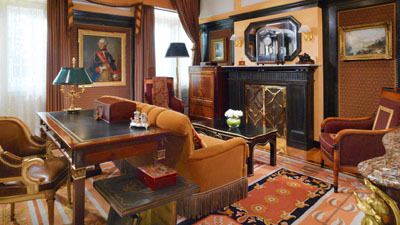 Bigger than the hotel's ballroom, the Dubai hotel suite that's a shrine to Sir Winston Churchill - The Telegraph. Cannes competition: Stars' Film Festival fight for the city's best hotel suites - The Telegraph. 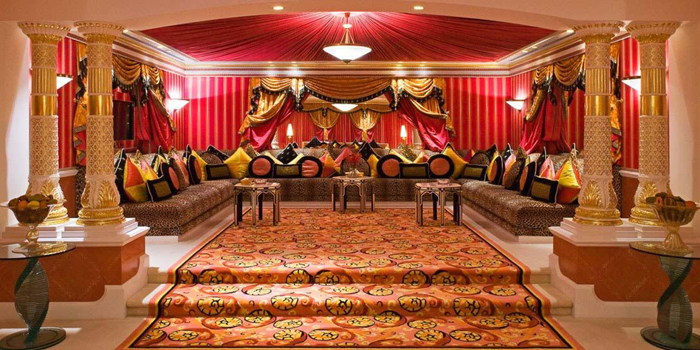 Doha's most over-the-top hotel suites - CNN travel. Dream Suite: The Conservatorium Amsterdam's Penthouse Suite - The Telegraph. Dream Suite: The Langham London's Infinity Suite - Telegraph. Dubai's best address? Inside the discreet designer suite in the world's tallest building - The Telegraph. 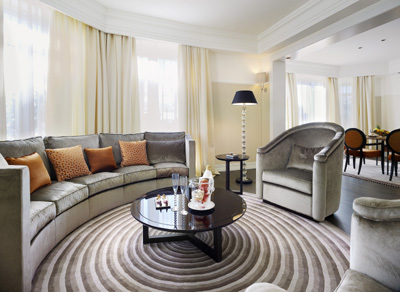 Four Seasons Hotel George V Paris - Room Finder. Forbes. HOTEL SECRETS - 8 TV documentaries. Richard E Grant delves into a super-rich lifestyle as he visits the world’s most luxurious hotels. By talking to everyone from porters to tycoon Donald Trump, he also uncovers some scandalous stories for the eight-part series. Inside Donald Trump's most luxurious hotel suites - The Telegraph. Inside the world's 25 most expensive hotel rooms - The Telegraph. Leading Suites - Leading Hotels of the World. London hotel suite on sale for $14 million - "If you're in the market for a new luxury pad, you could splash the cash on a 3,703 square foot hotel suite at 10 Whitehall Place, adjacent to the five-star Corinthia Hotel in London." New York's 23 best hotel suites - The Telegraph. 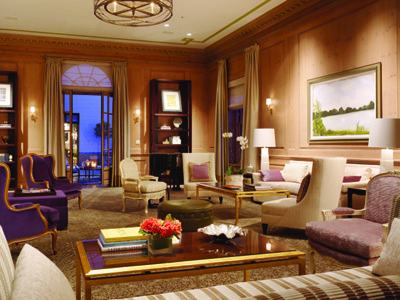 The Hotel Detective's Top 10 Luxury Hotel Rooms Of 2012 - Forbes. 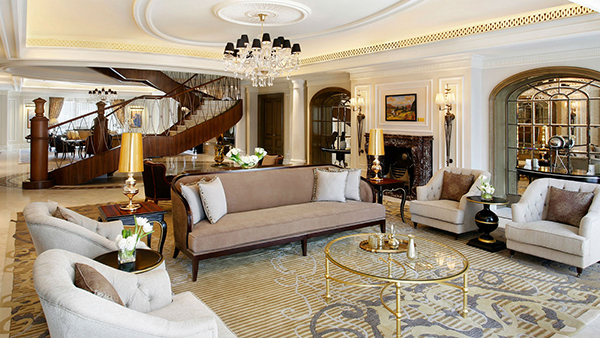 The Most Expensive Hotel Rooms in the World's Most Expensive Cities - Gizmodo. The Most Expensive Hotel Suites In The UK - "The priciest will set you back an eye-watering £18,000 A NIGHT." The Most Expensive Hotel Suites In The World - Bornrich. 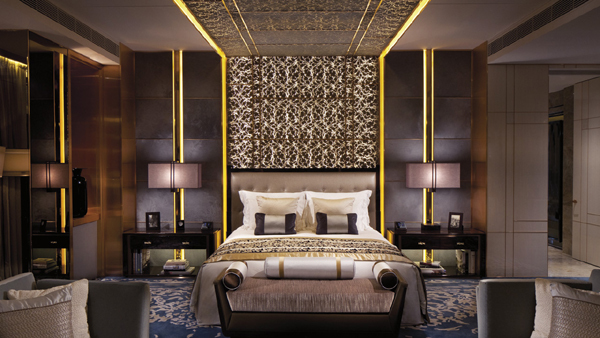 The Most Ridiculously Expensive Hotel Suites In The World - The Huffington Post. What it's like in The Goring's Royal Suite, where Kate Middleton spent her final night before becoming the Duchess of Cambridge - The Telegraph. 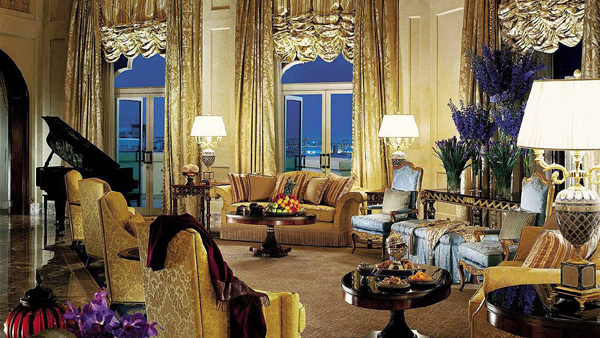 World’s 15 most expensive hotel suites - CNN Travel. world's best penthouse suites - The Telegraph. World's most expensive hotel suites - Fox News. World's Most Lavish & Expensive Hotel Suites - Condé Nast Traveler. 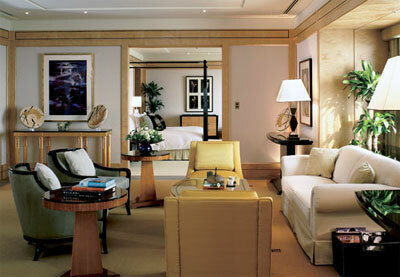 World's most luxurious hotel suites - The Wall Street Journal. world's most romantic hotel suites - The Telegraph. ARMANI DUBAI SUITE - ARMANI HOTEL DUBAI (Burj Khalifa, Dubai, U.A.E.). One of its kind with 390 square metres of space and elegance. Personally designed by Giorgio Armani, this magnificent and only suite is situated on level 39 and faces the Arabian Gulf with stunning city views. 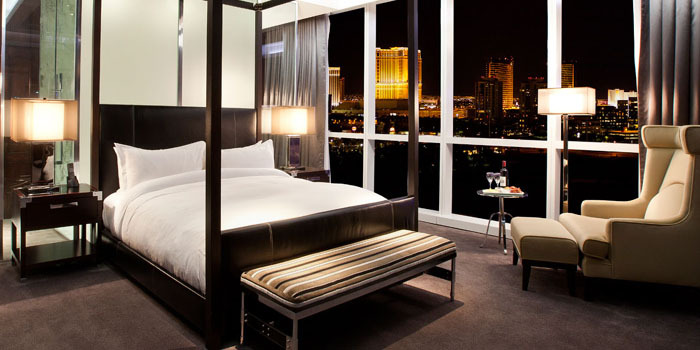 Augustus Suite 8818 - CAESARS PALACE (Las Vegas, NV, U.S.A.). The largest suite in the world. A billiard room, dining table for 20, indoor fountain, cinema, virtual golf course, and Jacuzzi make up just a small part of this colossal marbled penthouse, where a remote controlled toilet seat comes as standard. The good news is an overnight stay is free. 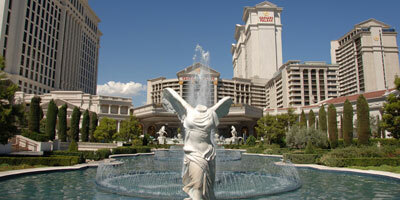 The bad news is it's by invitation from the President of Caesars Palace only. Price: US$44,000 per night. BRIDGE SUITE - THE ATLANTIS (Paradise Island, Bahamas). Offers guests spectacular views and ten sumptuous rooms full of unique amenities—including a 1,250-square-foot living room with a grand piano and twin entertainment centers, a dining room capped with a 22-karat gold chandelier and truly spacious bedrooms. The suite has 12-foot ceilings throughout with full length windows looking out from the bridge spanning Royal Towers’ 23rd floor. Bridge Suite also offers vacationers a permanent staff of seven, who access the rooms via a private entrance. Price: US$22,000 per night. Brook Penthouse - CLARIDGE'S (London, England, U.K.). 267 sq. m. / 2874 sq. ft. Designed by Veere Grenney, this elegant art deco-style penthouse apartment is decorated in gentle lilac with light oak floors and the trompe l’oeil effect on granite painted pillars. Inspired by 1930s' style to include purple furniture with cream, Greeney has also incorporated the more modern, predominantly French furniture with the traditional furnishings to achieve a clear idiosyncratic blend of old and new furnishings from the period. Lastly this spectacular London penthouse is complemented by a large furnished terrace which holds some of the best rooftop views that London has to offer. Price: £6,700 per night. CHAIRMAN SUITE - GRAND HYATT (Pudong, Shanghai, China). Spectacular skyline and waterfront views welcome you to a 277-sq.-metre suite on a private concierge floor. Amenities include Art Deco design, bedroom with two plush king beds, sitting and work areas, high-speed wireless Internet, kitchen and marble bath featuring jetted spa tub and high-pressure shower tower. Includes access to the Grand Club Lounge offering a private boardroom and serving breakfast, evening cocktails and hors d'oeuvres. Price: US$10,000 per night. CHAIRMAN SUITE - PARK HYATT (Pudong, Shanghai, China). The highest hotel in the world occupying the 79th to 93rd floors of the SHANGHAI WORLD FINANCIAL CENTER (SWFC). Bask in a luxurious, 194 sq. m. residence that features two king beds and master bath with heated floors, rain shower and window-side deep soaking tub, plus separate living and dining rooms, den and fully equipped kitchen. Panoramic Huangpu River views complement the conveniences of 24-hour in-room dining, in-room espresso machine and wireless Internet. Personal chef and butler available. Price: US$20,000 per night. 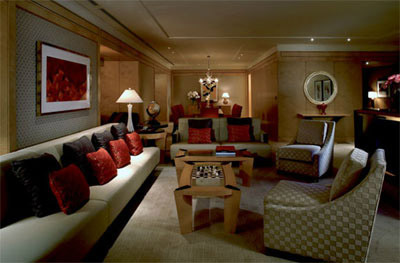 Champagne Suite - THE NEW YORK PALACE (New York City, NY 10022, U.S.A.). 5000 square feet, 464 square meters. 2 beds, St. Patrick’s Cathedral view, 6 guests, modern deco. 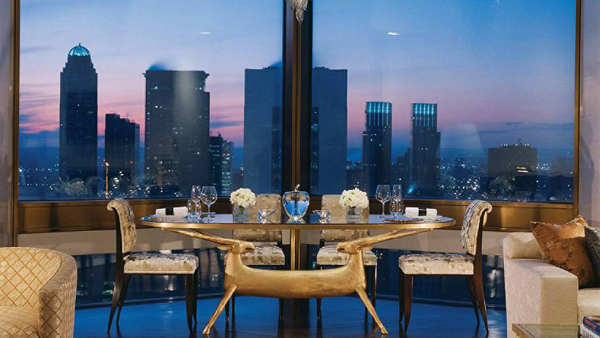 "The extravagant Champagne Suite is among the most luxurious accommodations in Manhattan, inspired by the exquisite taste of luxury champagne, such as Dom Perignon, sprawling 5,000 square feet over three floors of breathtaking vistas and spectacular décor. 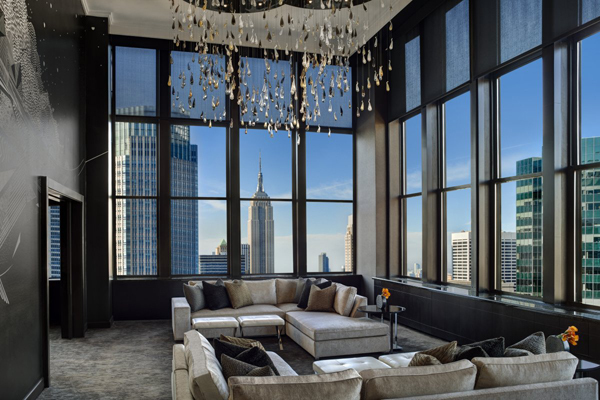 Carefully curated art and elements of contemporary opulence capture the varied richness of Manhattan life against a backdrop of warm blacks and bronze tones, creating an optimal atmosphere for relaxation and revelry." Price: US$25,000 per night. 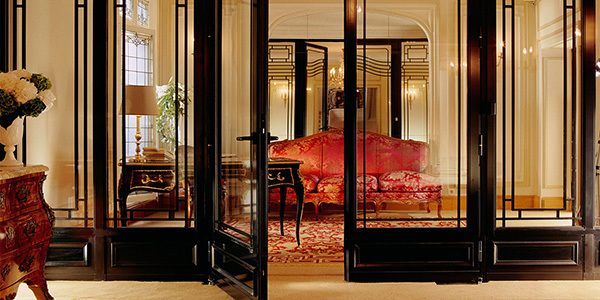 Coco Chanel Suite - at Hôtel Riz Paris, 15 Place Vendôme, 75001 Paris, France. 188m² / 2024 sq. 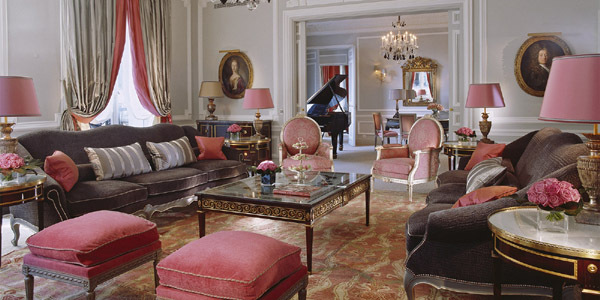 ft. Coco Chanel was intimately linked to the Ritz Paris and she decorated her Suite herself. In her world, luxury is all grace and refinement, a reflection of her love for Asian lacquer, gilded mirrors and the pairing of black with white. The Ritz Paris became her home. 18,000 - 25,000 per night. Davies Penthouse Suite - CLARIDGE'S (London, England, U.K.). 234 sq. m. / 2518 sq. ft. Enter the Victorian Davies Penthouse through a pair of magnificent rosewood and brass doors to a small bar area, ideal for welcoming guests. Experience the style and distinction of the 19th century with a large original fireplace, marble fixtures, wooden floors, a barrel-vaulted ceiling studded with lights and contemporary oil paintings on sunflower yellow walls. 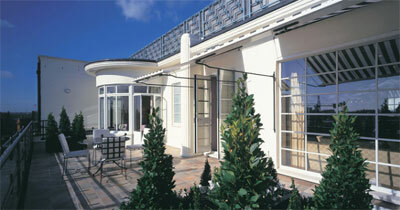 French windows also open onto a stunning terrace overlooking the rooftops of London. The Davies Penthouse is a perfect example of one of London's finest penthouses. Price: £6,900 per night. DIAMOND SUITE CHARLES GARNIER - HÔTEL DE PARIS (Monte-Carlo, Monaco). Overlooking the Place du Casino you can enjoy high profile events, with a ringside seat for the Formula 1 Grand Prix in a setting you will not find anywhere else in the world. Size: 170 sq. m., including the 40 sq. m. terrace. 2 bedrooms, an enormous lounge with dining area, 2 spacious bathrooms in light grey and white marble mosaics, and a dressing room. 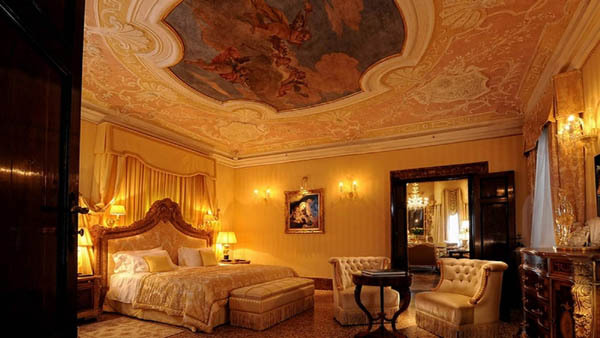 Doge Dandolo Royal Suite - HOTEL DANIELI (Venice, Italy). Boasting several balconies with 180° panoramic views of the lagoon, the sweeping 150-square-metre Doge’s Royal Suite offers a taste of regal life. Terrazzo alla veneziana floors, covered by antique carpets, anchor the museum-quality furnishings and artwork. The sitting area features ornate gilded Baroque armchairs, upholstered in green and gold damask—the colours echo the spirals of gold dust dancing in the 18th and 19th century Murano glass chandeliers. The soaring ceilings in the living room boast continuous dark wooden beams. A decorative fireplace with altar-like mantle presents the Dandolo family coat of arms, accented on either side by antique paintings of members of the royal household. Price: £10,000 per night. Eiffel Suite - HÔTEL PLAZA ATHÉNÉE (Paris, France). 1400 sq. ft. Situated on the 8th floor and decorated in the Art deco style, the Eiffel Suite offers a unique and incomparable view of the Eiffel Tower and 180° panorama of the Paris skyline. Each room in the suite are equipped with large windows offering splendid views of the Eiffel Tower, including the bathroom! 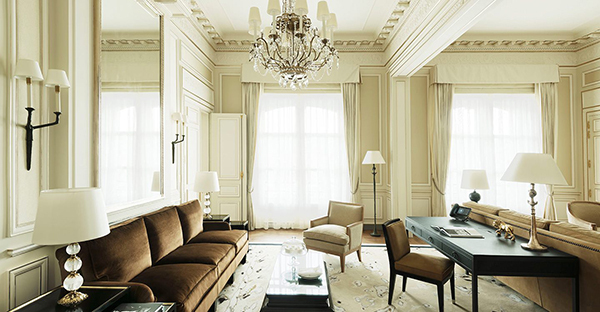 Empire Suite - THE CARLYLE (New York City, NY, U.S.A.). Spacious three-bedroom duplex located on floors 28 and 29, offers the best of both worlds. Blurring the line between hotel accommodations and a residential apartment, this one-of-a-kind suite was designed by Thierry Despont and presents 2,600 sq. ft. of living space, king-bed accommodations, four-and-a-half bathrooms, an office equipped with an Apple computer, full kitchen, separate sitting room and a private art collection. Both the living room and master bedroom feature unobstructed views of Central Park with floor-to-ceiling picture windows. Price: US$$15,000 per night. Hans Badrutt Suite - BADRUTT'S PALACE (St. Moritz, Switzerland). 280 sq. m. / 3013 sq. ft.: 3 bedrooms and bathrooms plus guest bathroom; salons, library and study, kitchenette, terrace and dressing room; remote controlled appliances for entertainment, lighting, drapes; steam bath and Jacuzzi. 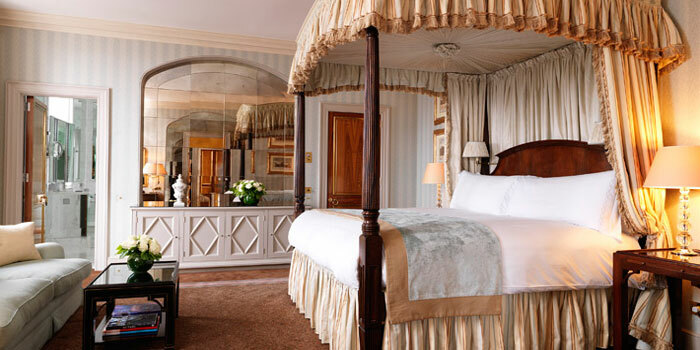 Harlequin Suite - THE DORCHESTER (London, England, U.K.). 2242 sq. ft. The largest of the three roof suites, The Harlequin is made up of a master bedroom with an ensuite bathroom and dressing room, a dining room, living room, bar and large outside terrace overlooking Hyde Park. Two sets of French doors lead onto the terrace and flood the room with natural light. It was in this very room that Elizabeth Taylor received the news of her record-breaking, multi-million pound deal to star in the epic Cleopatra. Panoramic views over Hyde Park. Price: £9,318 per night. 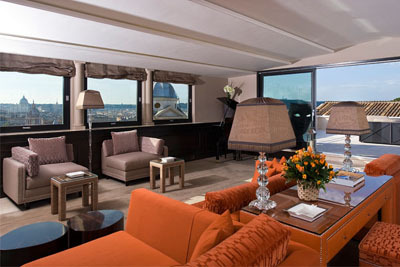 Hassler Penthouse - HOTEL HASSLER (Rome, Italy). Located on the Hassler's 8th floor, the brand-new 400 sq. 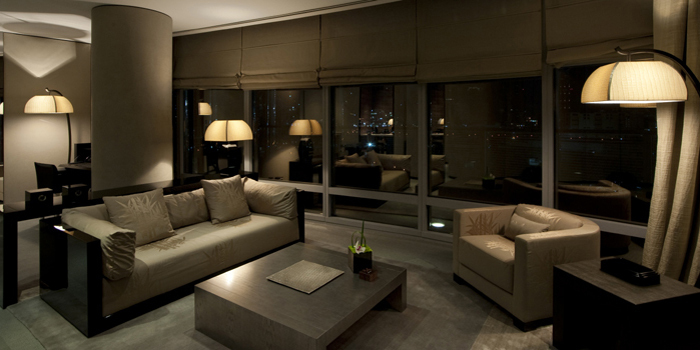 m. Hassler Penthouse suite was completed toward the end of 2012. Elegant, contemporary décor blends seamlessly with a state-of-the-art music and lighting system. Two panoramic terraces in Travertine marble define the perimeter of the spacious suite, as well as an elevator with direct access to the suite, grand piano and fully-stocked bar area adjacent to the dining room, a staff room with video-surveillance system, free Wi-Fi, a kitchen complete with custom-designed fine bone china tableware, and of course the breathtaking view of the historic center’s skyline of our hotel overlooking the Spanish Steps which may be admired from every room, including the spacious bathrooms. Private butler service to take care of every wish and need. HOTEL VICTOR PENTHOUSE SUITE - HOTEL VICTOR (Florida, U.S.A.): 4,000 square feet of indoor and outdoor space: private elevator, 360-degree views, rooftop garden terrace, private terrace with an outdoor hot tub, full-size, residential Viking kitchen, living room with sleeper sofa, two bedrooms with King beds with custom-made 300 thread count SFERRA lines, custom-made furniture by Jacques Garcia – sofa, desk, chair, lamps, 42" LCD flat-panel screen TV, DVD & CD player, iPod docking station, mini-bar featuring Dean & Deluca gourmet snacks and Kiki de Montparnasse accessories. 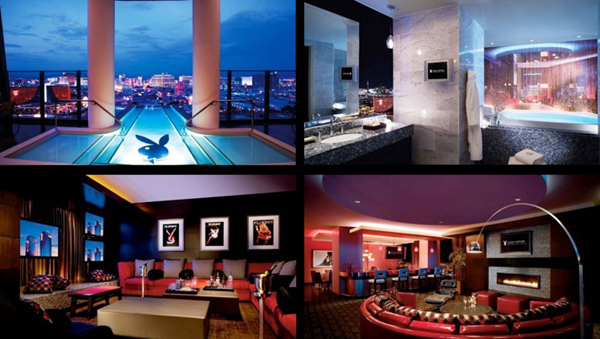 HUGH HEFNER SKY VILLA - PALMS (Las Vegas, NV, U.S.A.). 10,000 square feet: 2-storey, 2-bedroom suite features a cantilevered swimming pool with the best views in town, a giant rotating circular bed and a hot tub, bar and an indoor waterfall. Price: US$40,000 per night. Living Art Ultra Lounge Penthouse Suite - HARD ROCK HOTEL (Las Vegas, NV, U.S.A.). 4,276 sq. ft. Architect and designer Mark Zeff infused the Living Art penthouse with a dark palate and custom-created, sleek furniture using a variety of soft, sensuous textures. This 4,276 square foot specialty penthouse has an open floor plan equipped with seductive art, floor to ceiling windows, and an outdoor terrace with a plunge pool facing towering views of Las Vegas. 2 king beds, 1 double queen bed, 3.5 bathrooms. Outdoor terrace with plunge pool overlooking vegas strip. Price: US$7,500. Maestro Suite - THE DOLDER GRAND (Zurich, Switzerland). Inspired by Maestro Herbert von Karajan, the conductor. Classical music influences classic architecture: the Maestro Suite is located at the highest point in the tower of the Main Building at the Dolder Grand. The extraordinary Top Suite extends across two floors and offers a unique living experience covering 400 square metres. Two bedrooms each have a luxurious marble bathroom. In addition to a whirlpool and a steam shower, one of the bathrooms includes a sauna. The dining room has a classic design, is located in the tower and can be served by the private kitchen. The library is perfect for periods of work and quiet study. The comfortable tower room on the top floor invites you to relax. Here the dark red wooden beams at the top of the tower have been historically restored. A subtle seating area with sofas and couches, as well as a bar and a fireplace, round off the club-style atmosphere. The spacious balcony of the tower room is the highest vantage point at the Dolder Grand. 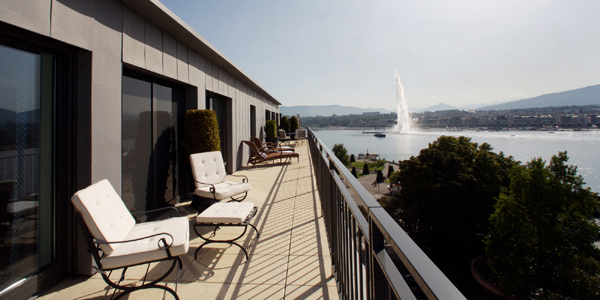 The Maestro Suite offers a further highlight for contemporary living in the open air: the private lounge terrace gives you a breathtaking view across the city of Zurich, the lake and the Alps. Price: US$$18,800 per night. 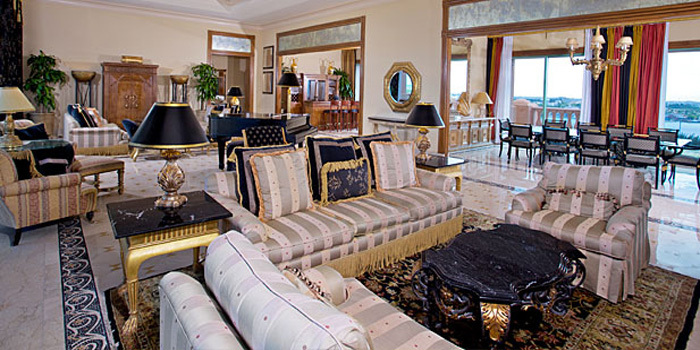 NILE PALACE SUITE - NILE PLAZA (Cairo, Egypt). 820 sq. m. / 8,826-sq. ft., 8-room suite with breathtaking 360-degree view of Cairo, the Pyramids and the Nile. Guests of the suite enjoy the services of a personal butler, trainer / therapist and chauffeur, and have their own private elevator for access to the suite. 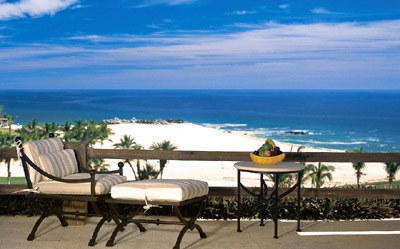 Oceanview Suite - LAS VENTANAS AL PARAÍSO (Los Cabos, Mexico). Located on the resort’s ground level, this suite features 3,900 sq. ft. of stunning living space with captivating views of the ocean and resort’s desert gardens. Two master bedrooms are furnished with king beds while a third bedroom offers two double beds; all three bedrooms have full bathrooms. Relax in the expansive living room or on one of the two large patios (one with Jacuzzi.) The suite also offers a full kitchen with wine cellar, dining area and butler service. 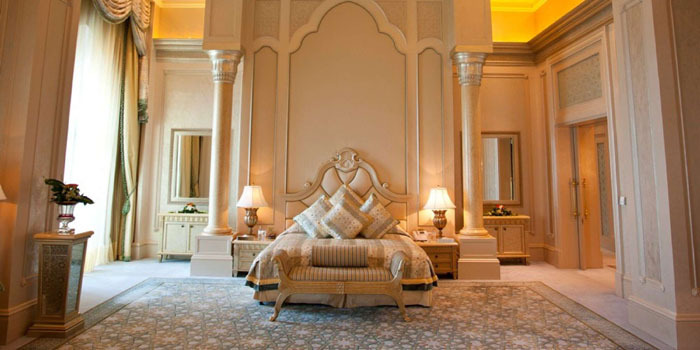 Palace Suite - EMIRATES PALACE (Abu Dhabi, United Arab Emirates). 680 sq. m. / 7,319 sq. ft. The ultimate in suite living, with spacious Majlis living area, three regal bedrooms, extensive terrace and an elegant dining room with pantry facilities. 24-hour butler. 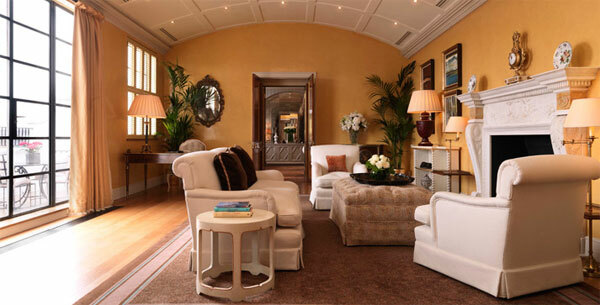 Palladio Suite - BELMOND HOTEL CIPRIANI (Venice, Italy). "Entering the Palladio Suite is like entering into another dimension: a glass capsule, suspended mid-air above the lagoon. One of the unique features of this Suite is a 180 degree view over the Venetian lagoon through floor to ceiling windows. The airy living room offers access to a private little balcony overlooking the lagoon. The elegant dining area allows guests to host small dinner parties served by a personal butler. Guests staying in the Palladio Suite have exclusive use of a large terrace with an outdoor heated long plunge pool and a heated Jacuzzi whirlpool, shaded by fragrant jasmine bushes. The master bedroom is sumptuously decorated and enjoys panoramic views across the magical lagoon." Price: 9,000 per night. 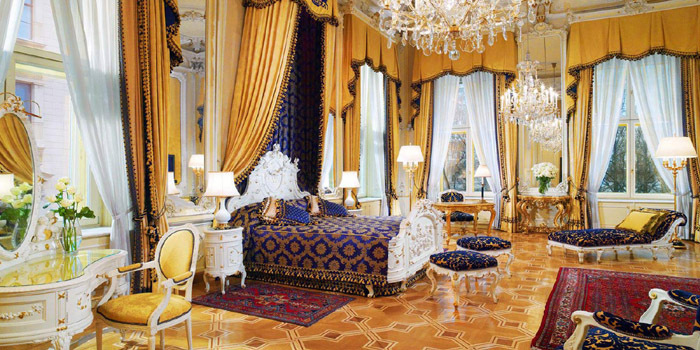 Patron Grand Canal Suite - THE GRITTI PALACE (Venice, Italy). 883 sq. ft. / 82 sq. m. Named after patrons of art, design and literature, Patron Canal Suites at The Gritti Palace immerse guests deep into the cultural and artistic roots of the city and this noble palace, while at the same time indulging visitors with the timeless spectacle of the Grand Canal outside. All four Patron Canal Suites - The Peggy Guggenheim Suite, The Punta della Dogana Suite, the Donghia Suite, and the suite inspired after John Ruskin - are made up of a separate living room, bedroom, and a luxurious marble bathroom. Penthouse Suite - MARTINEZ (Cannes, France). Art Deco decor invites visitors to relax in this beautiful two-bedroom apartment appointed with two king beds, living room and dining room (about 180 sq. m.). A private 290 sq. m. terrace with jacuzzi grants fabulous views of the Bay of Cannes, while the two marble bathrooms add to the feel of luxury. Amenities of comfort and convenience include bathrobe, slippers and wireless Internet. Price: US$37,500 per night. 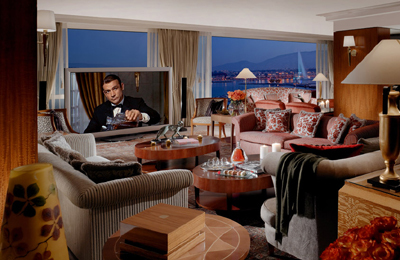 Penthouse Suite - THE FAIRMONT (San Francisco, CA, U.S.A.). 6000 sq. ft. / 557 sq. m. The extraordinary Penthouse Suite at The Fairmont San Francisco features three large bedrooms; four bathrooms; living room with fireplace, stereo system and plasma screen television; formal dining room; spectacular library; billiard room and an outside terrace overlooking the City and Bay. This exceptional San Francisco Penthouse suite accommodates up to 100 people for entertaining. Price: US$$15,000 per night. Prince of Wales Suite - HOTEL BRISTOL (Vienna, Austria). 350 sq. m. / 3,767 sq. ft. One of the largest suites of the country. The entrance is still embellished with the golden ostrich feathers from the emblem of Prince Edward VIII who once also resided here with his great love Wallis Simpson. The library with large dining table whets the appetite for literary matters, while the noble office captivates guests with antiques and unique pieces just as the large salon. A private fitness studio with sauna and the luxurious bathroom round off guests' wellbeing. 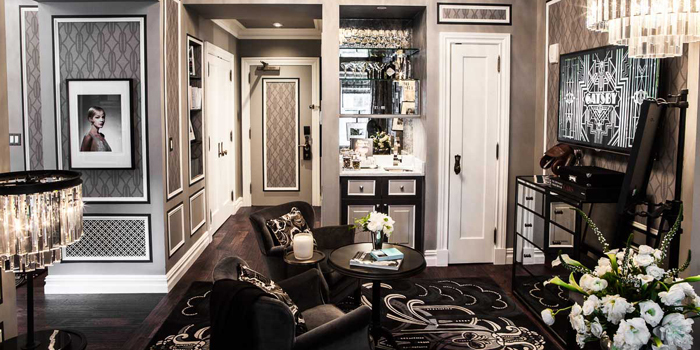 Two separate entrances turn the Prince of Wales Suite into a comfortable city apartment. Price: US$3,600 per night. 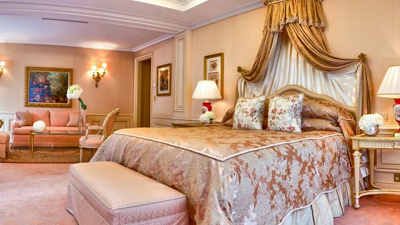 Princess Grace Suite - at Hotel de Paris, Monte-Carlo, Monaco. 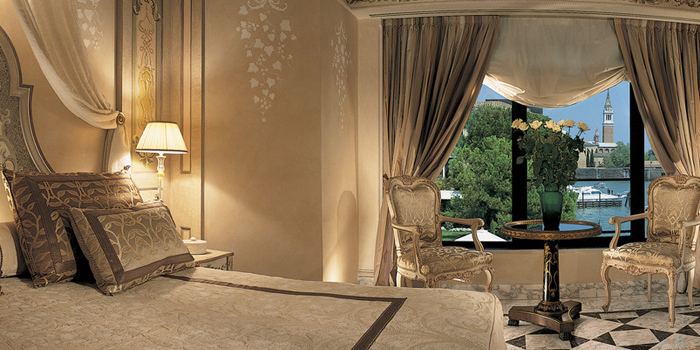 "The most exclusive and extraordinary suite on the Riviera." The exceptional 2-floors, 910-square-metre Suite boasts a refined, modern decor and spectacular terraces offering a 180° view of the Mediterranean. With its elegant curves and pure lines, the Princess Grace Suite is the epitome of sophisticated contemporary design, featuring transparency and precious materials. Price: 30,000. RITZ-CARLTON SUITE - (aka the 'Lady Gaga Suite') THE RITZ-CARLTON (International Commerce Centre, Kowloon, Hong Kong, SAR). 4,460 sq. ft. / 415 sq. 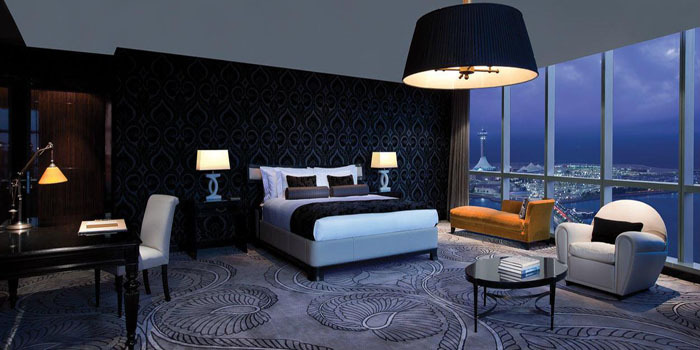 m. Breathtaking Victoria Harbour and Island views: located on floor 117 at the world's tallest hotel. Personalized stationery, sealy bed with 600-thread count bed linen, down feather pillows and throws (king bed), 47-inch flat screen LCD television, Blu-ray DVD player, Bang & Olufsen BeoSound 8 speaker dock, 160GB Classic iPod, iPod docking station, CD selection, en suite marble bathroom with 26-inch flat screen LCD television. Price: £10,000. 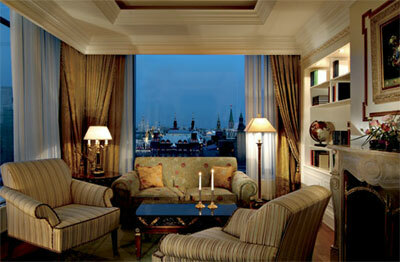 Ritz-Carlton Suite - THE RITZ-CARLTON (Moscow, Russia). 2550 sq. ft. / 237 sq. m. Floor-to-ceiling windows facing the Kremlin, Red Square, St. Basil's Cathedral and Christ the Savior Cathedral, classic furnishings exuding the Russian imperial style, spacious living room with a grand piano and dining area, library, office room and boardroom, flat screen televisions, top-of-the-line stereo systems and DVD, marble baths with separate rain shower and private sauna, access to the Club Lounge with five daily food and beverage presentations. 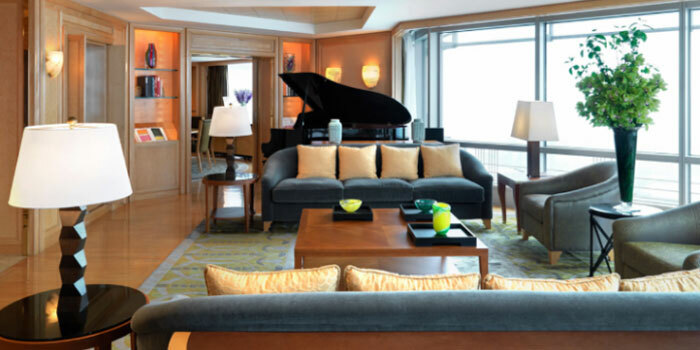 Ritz-Carlton Suite - THE RITZ-CARLTON (Tokyo, Japan). 3300 sq. ft. / 300 sq. m. Located on floor 53 with access to The Ritz-Carlton Club Lounge, dedicated Club Concierge, four poster king bed in Master bedroom, spectacular view of Tokyo including Imperial Palace outer gardens, two bathrooms, connected living room/dining room, walk-in closet and pantry, oversized marble bathroom with Sony BRAVIA 20 inch flat screen television, deep relaxing tub, individual rain-shower booth, double sinks and bidet. Price: US$26,300 per night. 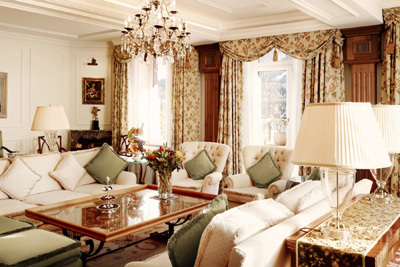 ROYAL ARMLEDER SUITE - LE RICHEMOND (Geneva, Switzerland). 190 sq. m. / 2475 sq. ft. Every detail has been thought of in our Armleder Penthouse. It serves as a showcase for a collection of art and antiques. A private furnished garden terrace offers wrap around views over the city, sparkling Lake Geneva and its famous jet d''eau against the mountainous backdrop of Mont Blanc and the Alps. The suite features an open-plan living room with a modern fireplace and an exquisite lounge area. The dining room with its handcrafted chandelier and original artworks seats 8 guests and includes a fully equipped separate pantry for seamless entertaining. Additional features include a writing desk with business-ready corner, a 127 cm flat screen television, DVD player, and iPod docking station. Price: US$18,900 per night. 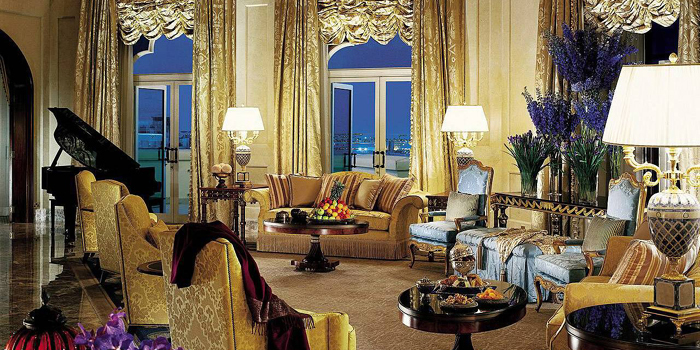 Royal Etihad Suite - JUMEIRAH ETIHAD TOWERS (Abu Dhabi, United Arab Emirates). 980 sq. 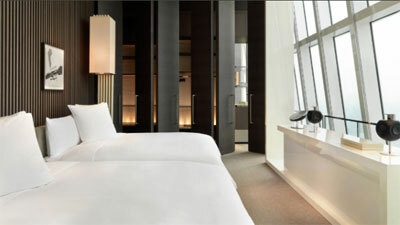 m. The highest suite in the hotel, its prime positioning affords magnificent views and reflects stature. Enjoy the private kingdom of separate bedrooms and an exquisite choice of three convivial living rooms. Dedicated butler service will see that your every requirement is attended to. Bathrooms make unwinding or getting ready a pleasure, and each features its own dressing area. Magnificent views and Club Executive Lounge Access promise even greater horizons of enjoyment. Price: US$18,000. 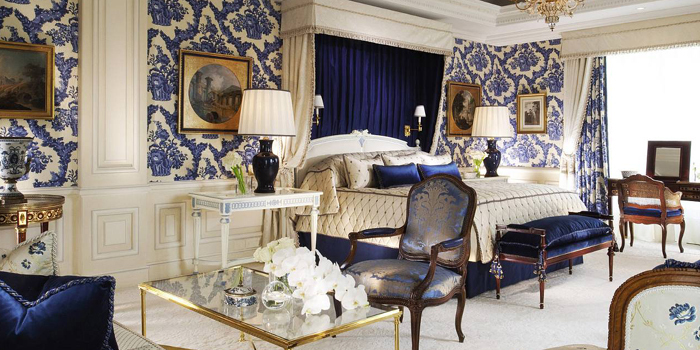 ROYAL ONE BEDROOM SUITE - GEORGE V (Paris, France). 245 sq. m. / 2,630 sq. ft. This sumptuous, antique-filled suite features oversized spaces for entertaining and relaxation, the business convenience of a private office and direct access to a private terrace. Featuring an oversized living room with marble fireplace, a dining area that seats up to eight guests and a complete, fully equipped kitchen. The spacious master marble bathroom redefines luxury with a steam room, a sauna and a walk-in dressing room with hairdressing facilities. Price: US$15,000 per night. ROYAL PENTHOUSE SUITE - HÔTEL PrÉSIDENT WILSON (Geneva, Switzerland). Known throughout the world as the most expensive, largest and most luxurious of hotel suites, the Royal Penthouse Suite covers the hotel's highest floor. It is unique in terms of luxury and comfort and guarantees a maximum security level: 12 rooms | 12 bathrooms | One of the first suites in Europe to feature a Bang & Olufsen BeoVision 4-103 flat screen and audio installation | Billiards | Steinway grand piano | Fitness center | Private elevator | Private terrace Surface area: 1680 m². Located on the eighth floor. Price: US$85,000 per night. ROYAL RESIDENCE - GRAND HILLS (Broumana, Lebanon). The Royal Residence measures an impressive 4,131 sq. m., and is recognized by Guinness World Records as the largest hotel suite in the world. The Royal Residence offers a fully appointed and richly decorated independent mansion, fit for Royalty. Following the Mouawad tradition for savoir vivre and elegance, the Royal Residence with its own private 2-swimming areas and 3 separate Pavilions offers a haven of luxury and personalized service which is unmatched by any hotel, anywhere in the world. ROYAL SUITE - BURJ AL ARAB (Dubai, United Arab Emirates). 780 square metres. Location: 25th floor. Private elevator, private cinema. Chauffeur driven Rolls-Royce, BMW or helicopter transfers available at a charge. Price: US$19,600 per night. 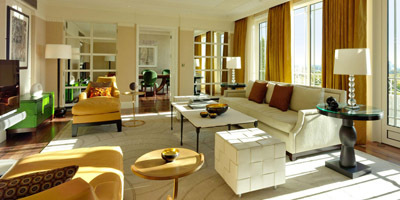 ROYAL SUITE - FOUR SEASONS HOTEL DOHA (Doha, Qatar). 84 sq. m. / 5,210 sq. ft. Two king bedrooms. A palatial two-level private residence on the Hotel's top floor. 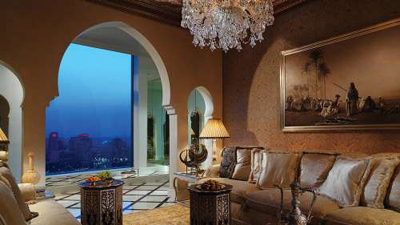 The Royal Suite offers glorious 360-degree views of the Arabian Gulf. 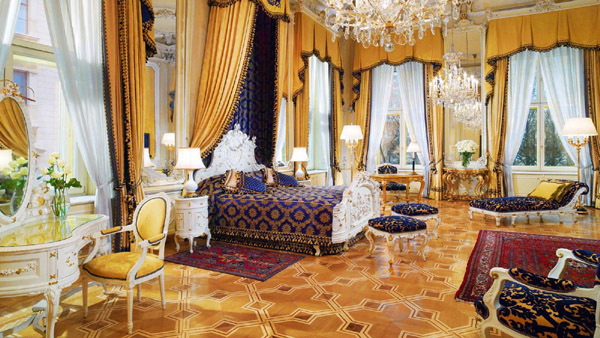 Royal Suite - HOTEL IMPERIAL (Vienna, Austria). Precious appointments, marble bathrooms and walls upholstered in silk: the Royal Suites present themselves in the manner of Schönbrunn palace on over 160 square metres. The masterfully crafted star-patterned parquet floors seem to creak with respect. Like the original antique porcelain ovens, the floors have been preserved and carefully restored. Padded double folding doors open onto the spacious bedroom and salon flooded with light. What ideas did movers and shakers play with in the quiet of the Royal Suites, what weighty decisions did they reach? Their spirit lives on in the historic halls to conjure up a unique atmosphere. Here you find yourself in a noble ambiance: in the morning, a butler brings the freshly ironed newspaper with a cup of Viennese coffee to your bedside. Royal Suite - HÔTEL PLAZA ATHÉNÉE (Paris, France). 450 sq. m. - 4,850 sq. ft. Located on the 5th floor, the Royal Suite overlooks the City of Light. It is a luxury suite, newly renovated and redesigned by interior designer Mari José Pommereau, a touch of true Parisian chic with French Regency furniture and other antiques creating extreme luxury in the purest tradition of French decorative arts. The 18th-century panelling, silks, damasks and fabrics come from the oldest family-owned businesses in France. All the embroidery is done with gold thread and the curtains, which combine three different threads, display the most elegant shading. The most sumptuous Italian marble has been selected for the Royal Suite from quarries in the Verona region to decorate the bathrooms. In fact, the Royal Suite at the Plaza Athénée promises its guests incomparable elegance, prestige, luxurious surroundings and breathtaking views.This is the largest 4-bedroom suite in Paris! Price: US$26,000 per night. Royal Suite - THE SAVOY, Strand, London WC2R 0EU, England, U.K. "Our new Royal Suite, opened in July 2016, is the jewel in The Savoy’s crown of suites comprising an open-plan procession of rooms spanning the entire riverside of the fifth floor. Titans of industry, world leaders, and visiting royalty, will enjoy an apartment-like space that not only represents the height of luxury, but that also reflects the style of home they would choose to reside in themselves." Costs £7,200 for the entire fifth floor. ROYAL VILLA - GRAND RESORT (Attica, Greece). Occupancy 5 adults, size 410 sq. m., exterior 670 sq. m., indoor pool 47 sq. m., outdoor pool 62 sq. m. The spectacular villa is stunning in terms of contemporary design, artwork objects , decoration features and services. It features two master bedrooms with king size beds, spacious living room with fireplace & dining table, two oversized marble lined bathrooms, one in each bedroom, as well as a guest bath. Butler's quarters include a room with separate entrance and a marble lined bathroom. Price: US$48,000 per night. 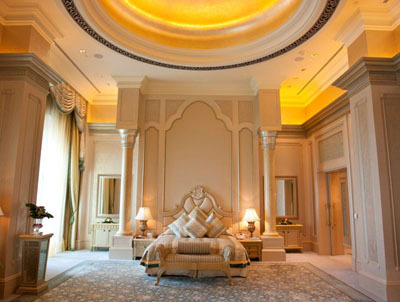 Sir Winston Churchill Suite - at The St. Regis Dubai, Al Habtoor City, Sheikh Zayed Road, Dubai, U.A.E. Located on the highest floors, and featuring delightful landscaped garden views, the three-bedroom Sir Winston Churchill Suite offers a vast living room with a formal 12-seater dining area, an elegant study, a lounge area, a majestic in-room staircase that connects to the rooftop plunge pool and a generously sized majlis that is ideal for meetings. 9828 sq ft / 913 sq m of sumptuous luxury. 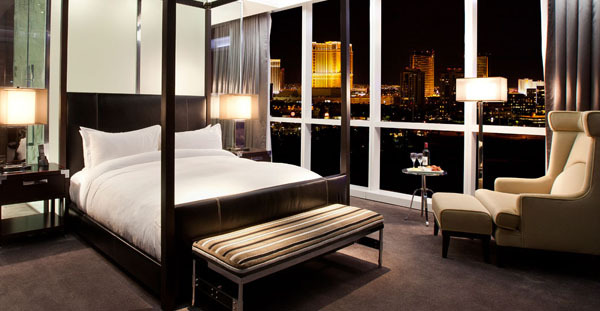 Sky Villa 12 - ARIA RESORT & CASINO (Las Vegas, NV, U.S.A.). 7,000 sq. ft. Feature panoramic windows to allow you to cast your eyes upon the lights of Las Vegas and absorb the energy that pulses from the streets to your soul. This duplex with a golden curving staircase has three bedrooms, each with his-and-her bathrooms, 36-foot ceilings, floor-to-ceiling windows, an iMac, a kitchen stocked with waters and juices, a gym with a steam room, and not so much space as acreage. The decor is exquisite and tasteful. Two full-time butlers will do everything from unpack your bags to rack up the balls on the Olhausen pool table. Price: US$7,500. 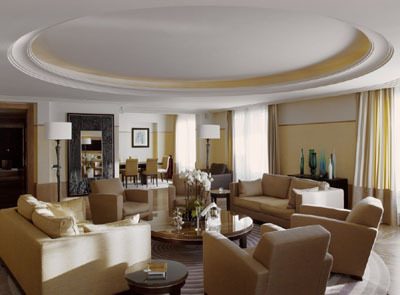 SUITE DES OLIVIERS - MARTINEZ (Cannes, France). Art Deco decor invites visitors to relax in this beautiful two-bedroom suite appointed with two king beds, living room and dining room (about 160 sq. m.). A private 250 sq. m. terrace with jacuzzi grants fabulous views of the seafront, while the two marble bathrooms add to the feel of luxury. Amenities of comfort and convenience include bathrobe, slippers and wireless Internet. Price: US$34,000 per night. 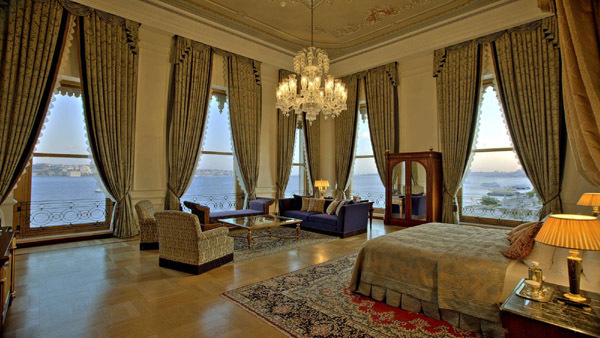 Sultan Suite - ÇIRAĞAN PALACE KEMPINSKI (Istanbul, Turkey). "Luxurious in Every Detail." 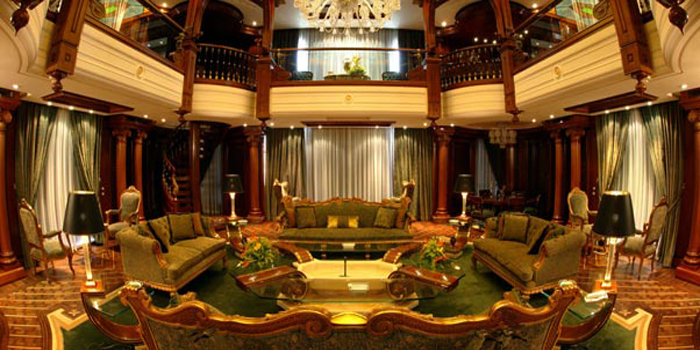 The Sultan of the suites ... One of the largest suites in Europe. 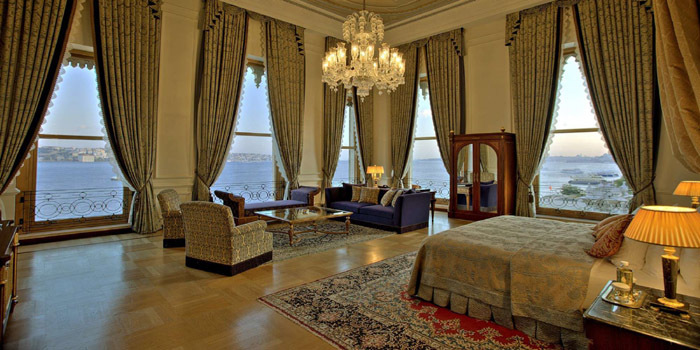 Offers 180-degree panoramic views of the majestic Bosphorus from all the rooms through the sash windows ... The suite boasts an LCD TV in the bathroom (32-inch), a Bang & Olufsen Stereo system with a CD and DVD player, a dining table for 12 guests, a magnificent master bedroom with a handmade marble hammam, a private steam room and rain shower (60-cm diameter head) with gold plated and crystal bathtub facets and a guest room with a claw foot Devon bathtub. The suite’s bathroom is the only bathroom in the Çirağan Palace Kempinski with a view of the historical peninsula. 24-hour butler service. Price: US$15,000 per night. 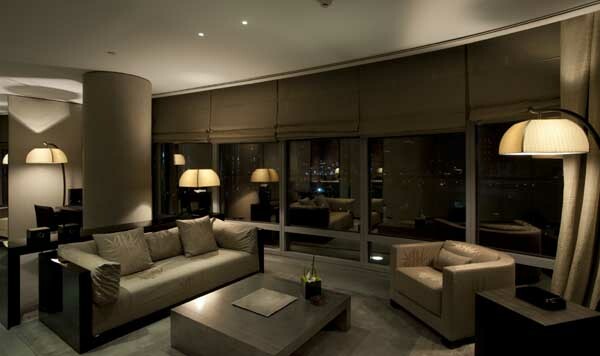 The Apartment Penthouse Suite - CONNAUGHT (London, England, U.K.). 285 sq. m. / 3068 sq. ft. Step through the front door of London's premiere penthouse suite and arrive in the height of Mayfair luxury. In his iconic Apartment, designer David Collins creates a London living space for a discerning clientele: well-travelled, with eclectic tastes in art, culture and literature. Then, the main rooms of the Apartment are designed for entertaining – from drinks on the balcony to a private dinner for up to 10 in the dining room. Decorated in light, reflective tones, The Apartment makes the most of its airy perch on the Connaught’s top floor with spectacular views over Mayfair, London. Though the same aesthetic unites the whole suite, there is a different feeling to each area. Price: US13,400 per night. THE FITZGERALD SUITE | The Gatsby Suite - THE PLAZA (New York City, NY, U.S.A.). "In this suite, the lines between reality and fantasy are blurred. It is an environment that evokes the history of the Fitzgerald’s at The Plaza. It will be a dramatic deco space that recalls the dynamism of the Jazz Age and the 1920s, hopefully making you feel as if you are a guest in a hotel described in one of Fitzgerald’s novels. F. Scott and Zelda Fitzgerald were both regular patrons of The Plaza. The association was so well-known, it is said that Ernest Hemingway once advised F. Scott to give his liver to Princeton and his heart to The Plaza." 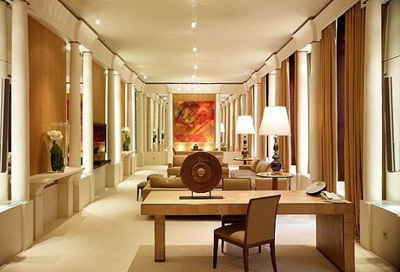 THE IMPERIAL SUITE - PARK HYATT (Paris, France). Located on the 2nd floor, the noble floor in Haussmanian buildings, this 230 sq. m. suite offers 4m high ceilings, a splendid 85 sq. m. living room, dining area, kitchenette, bar area, separate working area and a large walk-in dressing room. This suite offers 3 bedrooms, with two king beds and one queen bed. The suite also features 3 bathrooms and the in-suite spa concept. Price: US$20,000 per night. 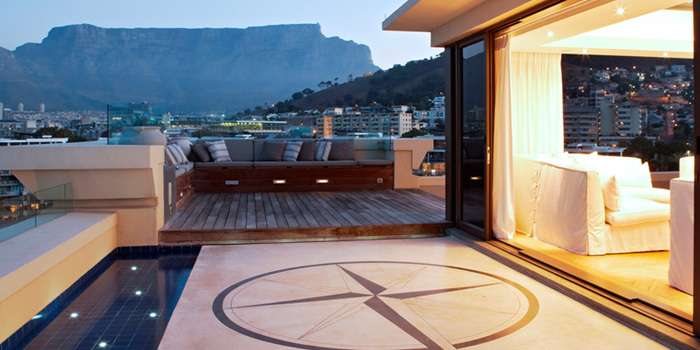 The One Penthouse - ONE&ONLY (Cape Town, South Africa). 725 sq. m. / 7,804 sq. ft. With its enviable location atop One&Only Cape Town’s opulent Marina Rise in the heart of the Victoria & Alfred Waterfront, The One Penthouse is a venue of incomparable luxury and exclusivity. Considered South Africa’s most impressive accommodation, the stunning two-storey penthouse features wraparound terraces overlooking Cape Town with breathtaking vistas of two World Heritage sites – the iconic Table Mountain National Park and legendary Robben Island. Encompassing an impressive 1,300 sq. m. of prime real estate, The One features four spectacular en-suite bedrooms, several lounges with atmospheric fireplaces, a stylish study, glamorous dining room, state-of-the-art kitchen, wine wall, fully equipped gym and large sauna. Two pools and outside entertainment areas create the perfect setting for indulgent evenings enjoying the 360 degree views of one of the world’s most beautiful cities. With a singular collection of South African art combined with truly captivating interior design, The One is resplendent living at its absolute finest. Price: US$$8,600 per night. 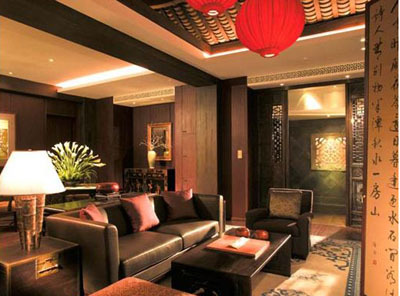 The Peninsula Suite - THE PENINSULA (Beijing, China). 7,104 sq. ft. Showcase suite displays the hotel’s particular blend of East meets West, with a neutral color palette and pops of Chinese art. Designed by Hong Kong architects Chhada, Siembieda and Leung, the suite includes a formal dining room that seats 18, a baby grand piano, a private gym and a full kitchen with a private entrance for discreet catering. 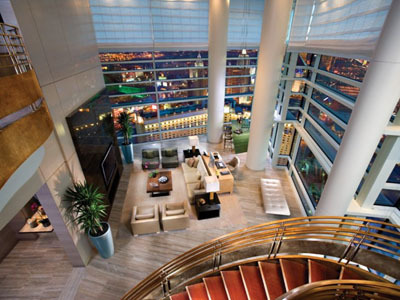 A dedicated elevator takes guests directly from the lobby to the penthouse. Price: US$8,000 per night. 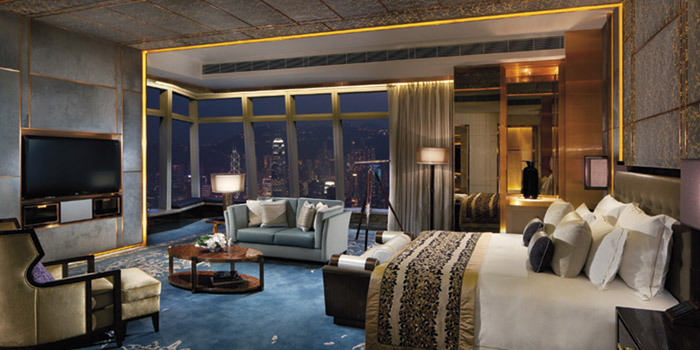 The Peninsula Suite - THE PENINSULA (Hong Kong, SAR). Situated on the 26th floor. "Truly palatial, The 4,111 sq ft (377 sq m) Peninsula Suite is unrivalled in its contemporary opulence. Situated on top of the Peninsula Tower, the Suite has the most breathtaking views of Victoria Harbour from the double-height living room with floor-to-ceiling windows and the exclusive landscaped terrace. Rich tones and sumptuous upholstery blend elegantly with the eclectic mix of contemporary and classically styled furnishings. Entertaining is effortless with a dedicated TV room featuring state-of-the-art entertainment systems, a 10-seat dining room with adjoining kitchen which allows guests to entertain in exceptional style complete with legendary Peninsula service. A comfortable private living room, palatial bedrooms, bathrooms, a gym and a cinematic screening room are separated from the main living area by majestic double doors." Price: £12,000 per night. 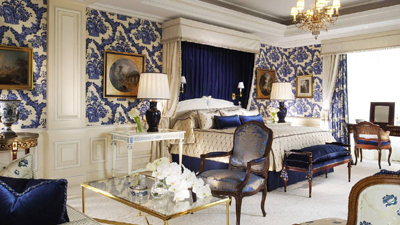 THE PRESIDENTIAL SUITE - GEORGE V (Paris, France). 200 sq. m. / 2,153 sq. ft. Include spacious living and dining rooms, with the ambience of a luxurious European residence and views of the Marble Courtyard and Avenue George V. Feature fabric-covered walls, crystal chandeliers, French School paintings, beautiful objets d'art and creatively arranged fresh flowers. The oversized marble bathroom includes all the expected amenities a steam room, sauna and bidet. You'll love the added luxury of a private fitness room and spacious walk-in dressing room. 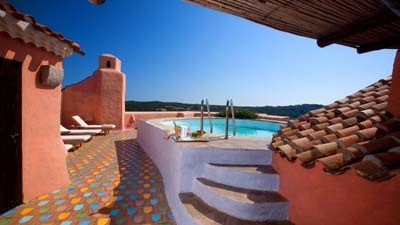 THE PRESIDENTIAL SUITE - HOTEL CALA DI VOLPE (Porto Cervo, Costa Smeralda, Sardinia, Italy). 450 sq. m. Three bedrooms, a solarium, a fitness area and a luxurious private swimming pool are completed by the large terrace and the sweeping vistas displaying the coastline's enchanting allure. Price: US$34,000 per night. 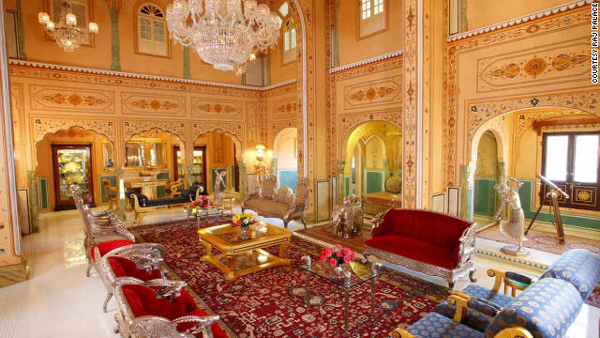 THE PRESIDENTIAL SUITE | Maharajah's Pavilion - THE RAJ PALACE (Jaipur, India). The suite is a four floor apartment with a private entrance through the Charbagh and the victory corridor, The Pavilion has a private elevator connecting all four floors and the total area of the suite is 16,000 square feets and has four bedrooms. Price: US$45,000 per night. 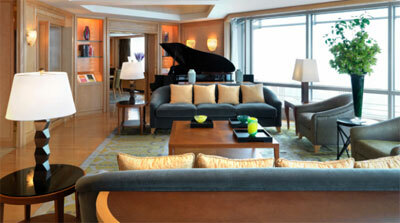 THE PRESIDENTIAL SUITE - THE RITZ CARLTON (Tokyo, Japan). 2,368 sq. ft. / 220 sq. m. Located on floor 53 with access to The Ritz-Carlton Club Lounge, dedicated Club Concierge, two bathrooms, connected living room/dining room, walk-in closet and pantry, four poster king bed in Master bedroom, spectacular view of Tokyo including Mount Fuji and Roppongi Hills, oversized marble bathroom with Sony BRAVIA 20 inch flat screen television, deep relaxing tub, individual rain-shower booth, double sinks and bidet, access to indoor pool and fitness studio. Price: US$25,000 per night. 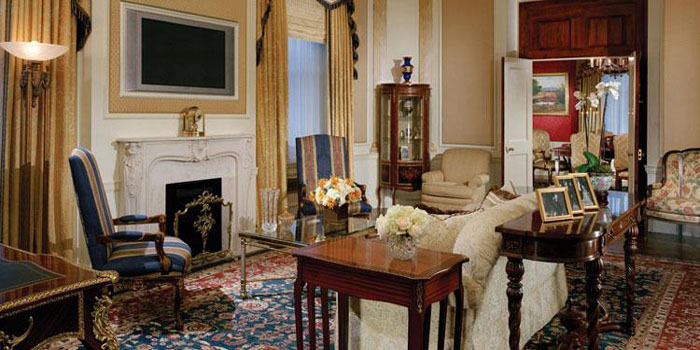 The Presidential Suite - WALDORF ASTORIA (New York City, NY, U.S.A.). The US$10,000 a night presidential suite. "No sitting President since 1931 has stayed in any other hotel in New York but the Waldorf." With 2,245 sq. ft. of living space, the 3-bedroom, 3.5 marble bathroom suite with master boudoir has accommodated eight decades of U.S. Presidents. When not required for heads-of-state or diplomats, movie stars, millionaires, corporate executives and private individuals occupy the Presidential Suite. Redecorated to resemble the White House with furniture reflecting a traditional Georgian style, it is home to the personal desk of General Douglas MacArthur and one of President John F. Kennedy's rocking chairs. The suite features a dramatic entrance, a large parlor, a dining room seating 10. THE ROYAL RESIDENCE - NUSA DUA BEACH HOTEL & SPA (Nusa Dua, Bali, Indonesia). 376 sq. m. Previously only available to royalty, The Royal Residence is now open to guests. The Royal Residence offers superlative elegance and unique luxury together with unsurpassed level of service. In a private enclave among the hotel's magnificent gardens, a private entrance heralds, one of the most secluded and beautiful villas in Bali. Price: US$3,200 per night. The Royal Suite - at The Goring Hotel, 15 Beeston Place, London SW1W 0JW, England, U.K. "Where Kate Middleton spent her final night before becoming the Duchess of Cambridge." Unveiled in 2011, The Royal Suite at The Goring is one of the most prestigious suites in London. Commissioned by Jeremy Goring to mark the hotel’s centenary celebrations, the spacious two-bedroom suite runs the length of the top floor of the hotel and each room has large French windows opening onto a large private balcony overlooking The Goring Gardens. 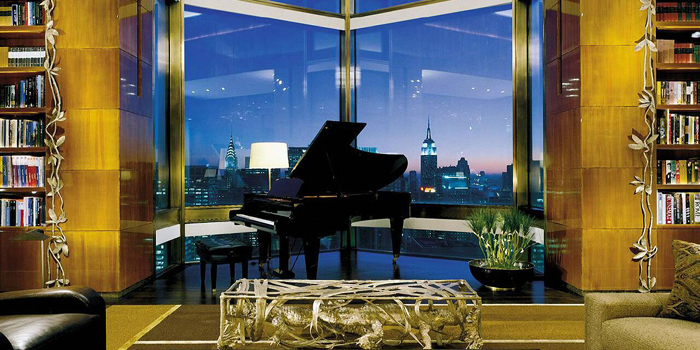 TY WARNER PENTHOUSE - FOUR SEASONS (New York City, NY, U.S.A.). The highest hotel suite (4,300 sq. ft. / 400 sq. m.) in a city located on the 52nd floor known for its legendary skyscrapers, the opulent, one-of-a-kind Ty Warner Penthouse soars 800 feet (244 metres) above the street. Created by visionary architects I. M. Pei and Peter Marino, the suite was seven years and US$50 million in the making and offers incredible 360-degree views. Price: US$44,000 per night. 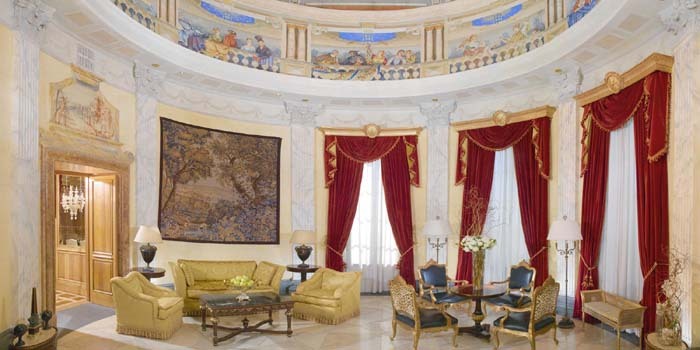 VILLA LA CUPOLA SUITE - EXCELSIOR (Rome, Italy). 1,100 sq. m. Located on the fifth and sixth floors of the hotel, overlooking the Via Veneto, Villa la Cupola is the largest suite in Italy. The central attraction is undoubtedly the domed living room, which features a breath-taking frescoed Cupola inspired by Roma's Palaces and Villas of Renaissance, Baroque and Neo Classical times. The imposing dome, almost 12 meters high, has been entirely hand frescoed. The color scheme of red, gold and pale grey was chosen to give emphasis to the blue sky beyond the round windows at the top of the vaulted ceiling. 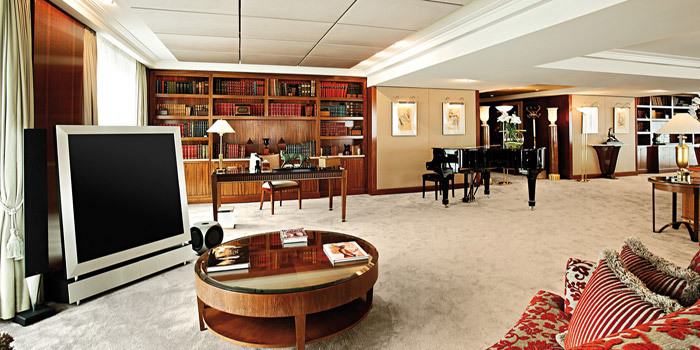 The study connects with the living room, completely paneled in elegant Italian oak wood and equipped with state-of-the-art audio-visual technology. A private kitchen serves the luxurious dining room which is dominated by a magnificent Murano glass chandelier and an antique dining-table decorated with mosaic marble. An exclusive selection of vintage wine and champagne await in the private wine cellar. A unique feature of the suite is a private Dolby-Surround cinema and videoconference room equipped with state-of-the-art audio-visual technology ideal for professional multimedia presentations, video conferencing or simply high quality TV/DVD entertainment. Price: US$31,000 per night.